"Faceless" is the third album from the Boston based noise terrorists. New drummer Shannon Larkin was previously in Amen (I bet he has some salacious gossip on Casey Chaos and his cohorts). 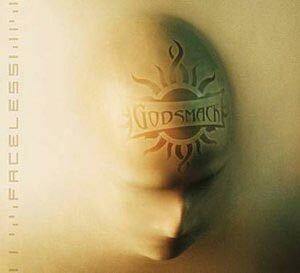 For the readers out there who are unaware of Godsmack's history then i'll quickly fill you in on a few vital details. They were formed in 1998 and had an album banned from Walmart and K-Mart for it's supposedly profane content, but as the old saying goes "all publicity is good publicity" and as a result the bands sales rocketed to over four million copies. "Straight Out Of Line" opens with the sound of hovering helicopters and gunfire in an unspecified warzone. Quite a topical way to express themselves in the current political climate. Guitarist Tony Rombola is unbelievably gifted in his playing, versatile and controlled and matches Sully's macho, gruff and passionate vocals. The sound of a man on a mission when her hollers "I can't find a reason why I should justify my ways" you have no reason to even begin to doubt the great man. "Don't look down on me" is an instruction to be obeyed at any cost on the track "Changes". You can't go wrong with a melody this strong and lyrics which can't fail to put a smile on my face. To my ears this is in the same league as Soundgarden. The relentless impassioned drumming on the threatening "I F**king Hate You" deserves mentioning on this grungy gem. "You crucify my name" which isn't exactly a compliment, but this is truly an unabashed hate song which although honest is also vitriolic, bitchy and resolutely unforgiving. I've never met Godsmack's lead singer, but its clear to anyone with half a brain that Mr Erna is a man not to be crossed or indeed dissed. "Awake" is the second of two live recordings, the final being "Keep Away". This captures the band at their most ferocious. It has much in common with those Iranian American System Of A Down. Even for the most casual consumer of rock music "Faceless" would be a welcome addition to their record collection. Godsmack sound better than ever and have yet to reach their peak.